Yesterday we continued looking at the Christian story as a six act play. Act 1 was creation, that we were created to love God and be loved by God. Act 2 was rebellion, when we learned that humans pushed God’s love away. We continue an overview of the Christian story in six acts with Act 3, Israel. Question: Have you ever tried to make yourself “right” with God, or to be perfect? Is it possible? Have you ever met a perfect person? Yesterday we continued looking at the Christian story as a six act play. Act 1 was creation, that we were created to love God and be loved by God. Act 2 was rebellion, when we learned that humans pushed God’s love away. 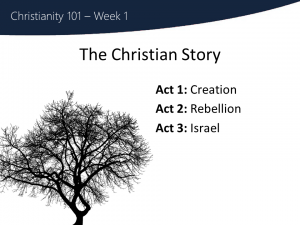 We continue an overview of the Christian story in six acts with Act 3, Israel. So what did God do after we rebelled? Let us figure it out on our own? Forget about us and move on, create another world on Mars, or somewhere else? He chose a small group of humans – beginning with one man named Abraham, but eventually the whole national of Israel made up his descendents – and said he would bring the world back to his plan using them. He began to work with them, to remind them of the script he had written for our world. Think of it as a school play…when the kids forget their lines, the director is off stage, prompting the actors to remind them of their lines. Giving them help, guidance, correction. This is what God did by giving Israel the ten commandments, and his laws, and prophets. Reminding them of how they were meant to relate to each other, their world, and God himself. Unfortunately, God’s people seldom listened, and even when they did, they very quickly went off script again. That they are too rebellious to actually do this on their own, and need the director to actually intervene. And so the play continues off script, with the director off stage prompting, but nobody on stage listening or acting in the way he guides them. Have you ever tried to make yourself “right” with God, or to be perfect? Is it possible? Have you ever met a perfect person?